November 6, 2018 General Election! Go to our VOTER TOOLKIT for everything you need to know about voting! Learn about general voter information and current elections. Which candidates and what measures are on the ballot in the next election? 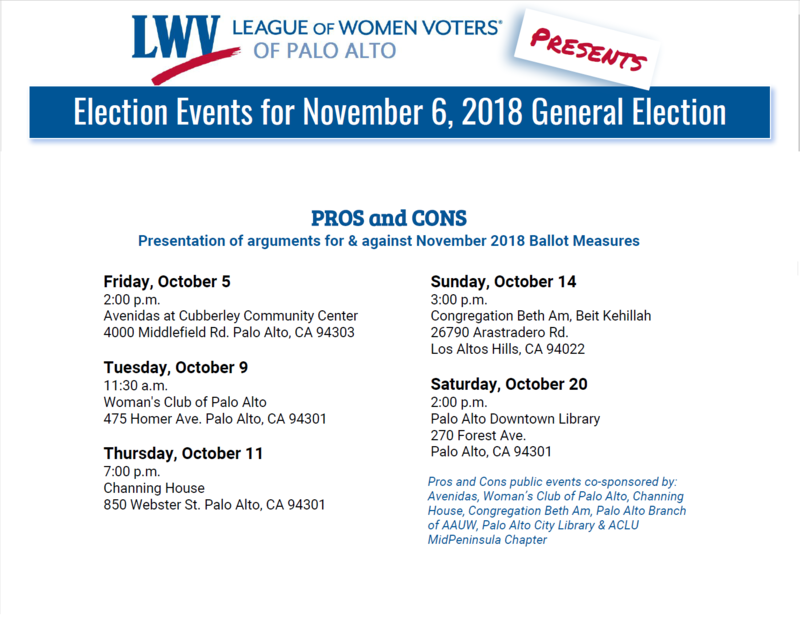 The League of Women Voters of Palo Alto schedules local candidate forums and presentations for the pros and cons of ballot measures every election season. These events help YOU become an informed and educated voter as you get to hear from candidates, as well as arguments for and against ballot measures, moderated in a nonpartisan, League format. These Voter Guides help simplify the voting process and help you navigate the many ballot measures, propositions, and candidates so that you can a knowledgeable voter. Election Events: Be an informed voter! ​The November ballot includes Federal, State, and local candidates running for office. There are congressional, gubernatorial and state assembly races, as well as local Palo Alto City Council and PAUSD School Board contests. Videos available! 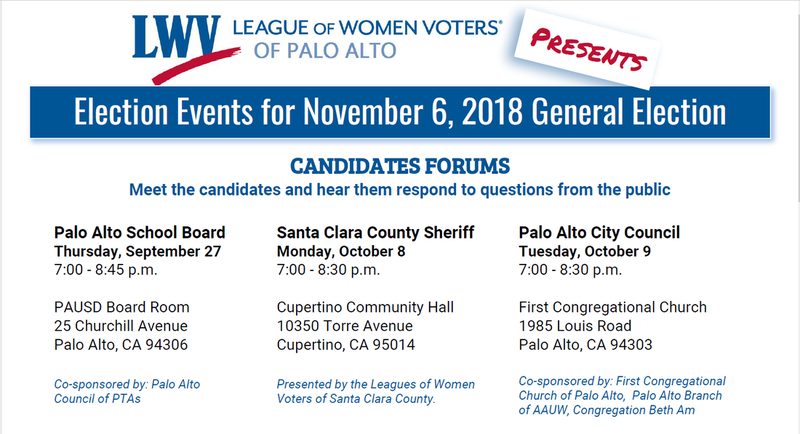 The Palo Alto League has presented nonpartisan Candidate Forums for local candidates, and the Southwest Santa Clara Valley League presented a forum for County Sheriff candidates. To watch the forum(s) of your choice, see just below ("WATCH TV Recordings..."). WATCH: TV Recordings for Candidates Forums courtesy of MidPen Media Center. explanations of measures on the ballot, including the provisions, fiscal effects, main arguments for and against, and the supporters and opponents. explaining the pros and cons of the eleven California state propositions on the ballot, as well as local Palo Alto and Santa Clara County measures. To view a video presentation of the Pros & Cons, see below ("WATCH TV Recordings..."). WATCH: TV Recordings of Pros & Cons courtesy of MidPen Media Center. ​Check our Calendar for more info. The Advocacy arm of the LWV makes the recommendations on state and local ballot measures. After careful study and analysis, the League of Women Voters of California and the League of Women Voters of Palo Alto offer these recommendations. Yes, the League of Women Voters are nonpartisan regarding political parties and candidates - we do not oppose or support them. However, we do take positions on issues and support or oppose ballot measures on public policies that align with League positions. Once we have studied an issue and taken a position, we take action and advocate for or against particular policies or laws related to that issue. If we do not have a studied position on an issue, we will not make a recommendation. ✅YES on E Transient Occupancy Tax would increase the hotel tax from 14% to 15.5% to generate money for the city's general fund, without taxing residents, to help complete projects such as the new public safety building and other municipal needs. LWV supports maintenance of city services at the highest level possible. Simple majority needed. ✅YES on Z School Bonds ($460 million), to continue upgrade started in 2008, including multi-purpose rooms, classrooms, auditoriums at Gunn and Paly, and the Paly Tower. LWVC consistently supports funding public education facilities to ensure a quality public education, essential to a democracy. 55% majority vote needed. ​Read more on the ballot recommendations and why here on LWVC's webpage. Click image to view the Official Voter Information Guide for the November 2018 General Election, published by the California Secretary of State and is mailed to every registered voter in California in October.